Mia's Garden: Another Jack-and-the-beanstalk-type plant! 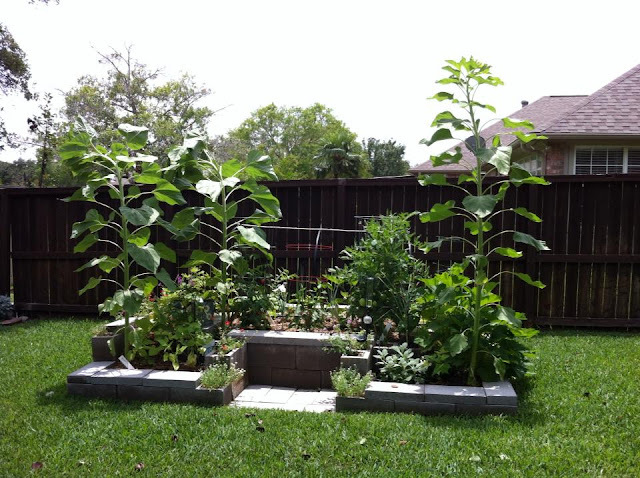 How much taller will these sunflower plants get before they produce a flower? "Come on little okra plants - you've got alot of growing to do to catch up with these!" In the front sections, I've planted bush beans and sage. On the right section are yellow squash and zucchini plants. On the left are new potatoes almost ready to harvest. Center section contains tomatoes, bell peppers, eggplant, sweet potatoes, and okra. but this design makes square-foot gardening alot easier to manage.